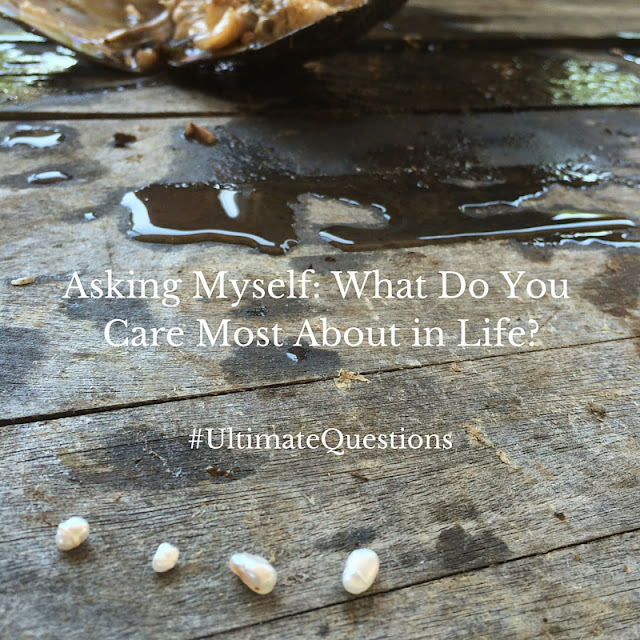 Behold & Reflect: Asking Myself: What do I care most about in life? This is the sixth installment of my series "Asking Myself," in which I weekly ponder one question posed in Teresa Blythe's rich book, 50 Ways to Pray. You can find the start of the series here and last week's post here. Q: What do you care most about in life? Is it just me, or are these questions getting harder? I've tried to answer this in my head several ways... trying to sound a little more spiritual and a little less selfish. But when it comes down to it, I'm still pretty self-focused in my biggest care. I care most about coming into my personal, God-given talent or gifting or calling or destiny. Pick your Christianese flavor. I can't get away from this particular longing because through becoming what God made me to be, I hope, I assume, God will be honored and glorified. And there's a pretty good chance, as He is my Abba, and those talents were part of the package deal as He knit me together in my mother's womb. Secondly, by paying careful attention to my own work (Galations 6:4-5 MSG, Read it! It's lovely!) by pursuing a seemingly selfish aim, I hope the second half of the Greatest Commandment is also fulfilled to some extent. By being the very best Emily I can be, by ever stretching forward and pursuing God like Paul in Philippians, by moving in unison with Him in all the unique tasks He's prepared for a person like me, I believe I'll bless and love others with the blessings and love that can only come from God. So, not so selfish after all? Let me just put it out there. I am self-centered. I mostly just care about being known, accepted and found lovely by Someone Important. Many times this consuming need can be and is filled by kind words sent from a friend, by a knowing look from my husband, or by a snuggle from my son. But I think by now I know that no single human being—heck, not even an army of adoring fans, were they to be found—could fill this void, this need, this consuming care. It goes back to that God-shaped hole, Pascal's "infinite abyss," Ecclesiastes' "eternity in our hearts." Who or what could fill that but Jesus? Again, I don't want to get too spiritual and skirt the honest answer to the question, the answer that makes me most uncomfortable as I wrestle with it. While my first answer is a true one, I feel there's another care that motivates many of my daily thoughts and actions. I've been reading through my first journal (circa 1992), and have been confronted with a shamelessly shallow beta-version of myself. A very obvious theme has emerged. And I have to admit, I'm still a recovering people-pleaser whose greatest care is for acceptance and belonging. And not just in a "sure, you can hang with us" kind of permission to coexist in others' spaces from time to time. No. I want people to know me intimately. What I mean is I want to be known, to be "memorized" as a Bethel worship song declares. I want someone to say "You belong here! We've been waiting so long for you-- specifically you!" I've borrowed this sentiment from another song. Check it out.) I'm not confidently proud of it, but this is probably the thing I care about most in life. Possibly more than pleasing God. So, Lord, have mercy! P.S. I want to clarify that the above wishlist is a confession, NOT a hint to friends and acquaintances that you aren't loving me well. Instead, I would love to know what you think about the question. How would you answer it? Next week: What is revelation from God? When have you experienced it?